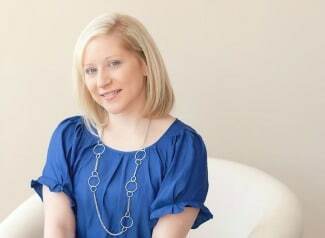 Easter is only a few short weeks away and Renee of Two in the Kitchen is here sharing the perfect Easter treat – Peanut Butter Gooey Easter Bars! The Easter holiday is the perfect time to gather with family and enjoy delicious desserts. Why not add this recipe to your list this year. The kids will love them and so will everyone else! Easter treats are so pretty with all of the bright pastel colors. I can never have enough Easter candy! And with that thought, I realized that I haven’t made a single Easter treat yet. Ahhhh …. I am SLACKING for sure. So I can wait no longer. 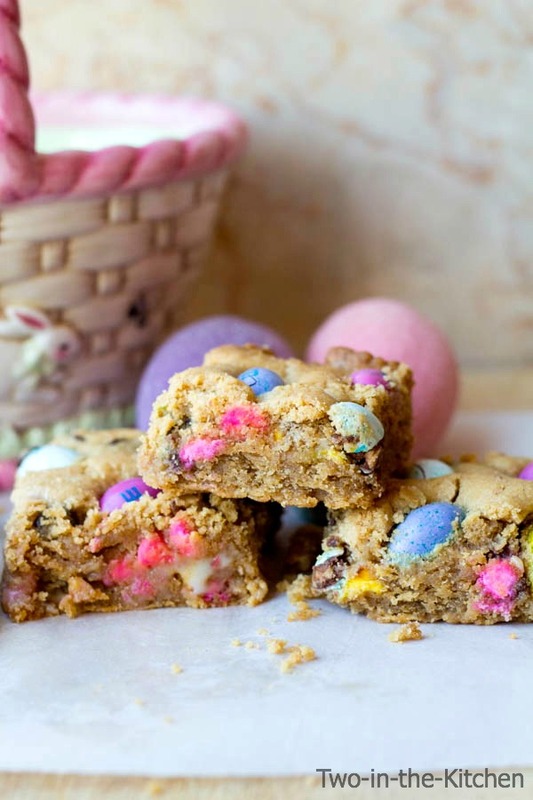 I had to share these amazing Peanut Butter Gooey Easter Bars with you! 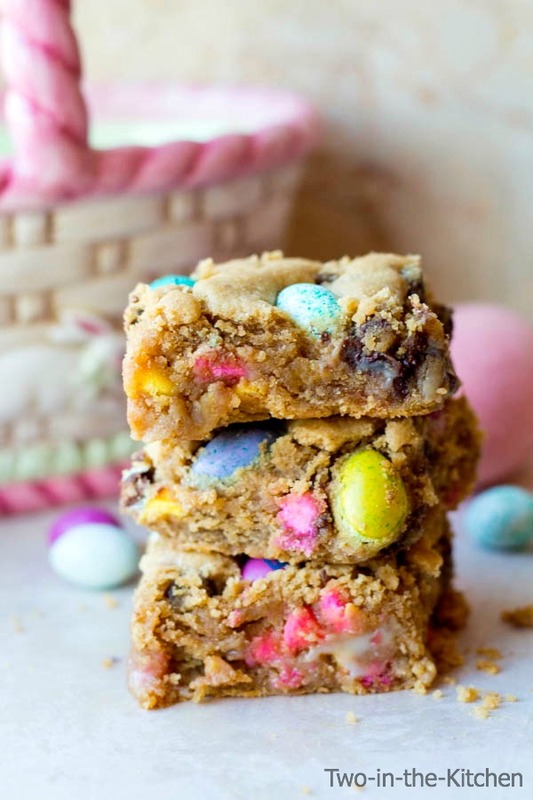 These bars incorporate my favorite Easter indulgence: Peanut Butter M+M eggs. Have you tried these yet? They are sincerely gobble worthy! I have literally been eating them by the handful straight out of the bag for a couple of weeks now. I finally decided that I need to stop eating them out of the bag and make them into a yummy baked Easter goody! These bars really did turn out amazing!! In fact, my husband said they are the best thing I’ve made recently as he devoured a couple of bars in one sitting. They are loaded with peanut butter flavor, springtime chocolate chips, and these adorable peanut butter M+M’s. And to make them ultra ooey and gooey, they have condensed milk poured in the center of the bars. They are so soft and flavorful that it’s really hard to eat just one. (Consider yourself warned!) Between my husband, myself and the three kids, I think we gobbled up the whole pan in a day and a half! I do hope that you have a wonderful family filled Easter this year! 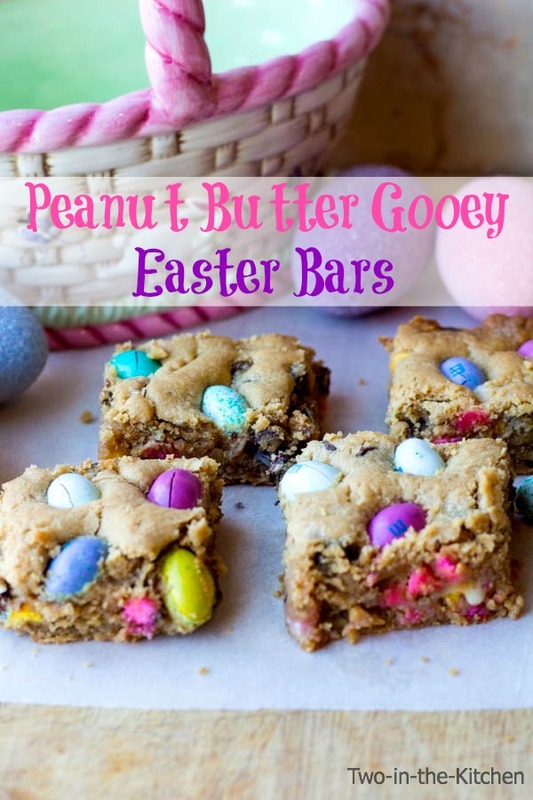 And I hope you will enjoy it by making lots of great food and yummy treats like these Peanut Butter Gooey Easter Bars! 1. Pre heat the oven to 350 degrees and foil and spray a 9×13 pan with baking spray.2. In a large mixing bowl, cream together the butter and sugar. Mix in the peanut butter until blended. Add the eggs, mixing one at a time. Mix in the vanilla. 2. In a medium bowl, sift together the salt, baking powder, cinnamon and flour. Add the flour mixture to the peanut butter mixture in three additions, mixing each time until blended. 3. Stir in the chocolate chips, reserving 1/2 cup for later. 4. Using half the batter, drop several spoonfuls of the batter in the pan and spread and flatten evenly. Evenly pour the condensed milk on top and sprinkle the remaining half cup of chocolate chips over that. Using hands, flatten the remaining batter evenly over the top until the top is covered with the dough. 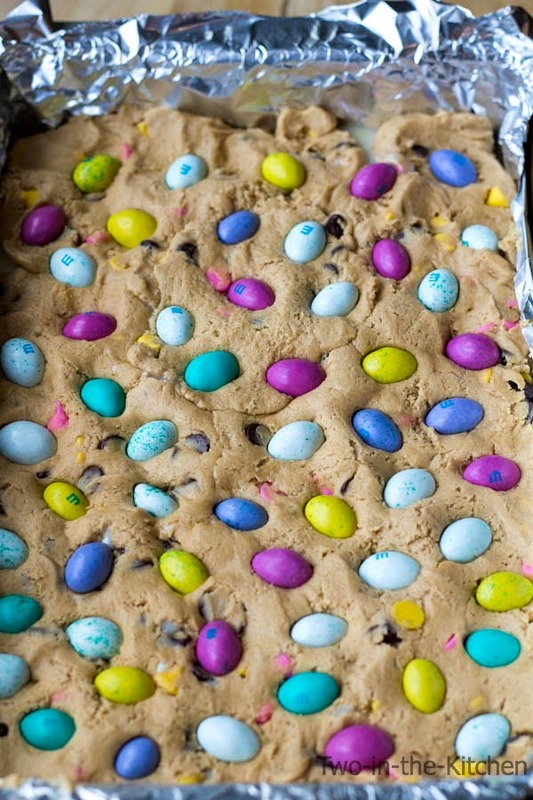 Press the peanut butter M+M eggs all over the top of the dough. 5. Bake in the oven for 30-35 minutes, or until the edges have slightly browned, the center no longer jiggles and a toothpick inserted comes out fairly clean. 6. Remove from the oven and allow to cool for at least a half hour before slicing into it. Slice and serve. Sign up for a 30 day free trial of Amazon Prime and get free 2-day shipping on your products!